* This review contains spoilers for the previous book, Shiver. To Sum It Up: Sam's cure seems too good to be true, even to Sam. As he tries to believe that he can now spend the rest of his life with Grace, he also attempts to reconcile himself to the fact that he might be the only one who can help the new wolves, including the very complicated Cole St. Clair, adjust to their new lives. But Sam has no choice but to face the increasing evidence that something is very wrong with Grace; after everything they've been through to keep Sam human, they may not be able to stay together after all. Review: It's book two into Maggie Stiefvater's The Wolves of Mercy Falls series, and I am madly, madly in love with it. Each page is an exquisitely composed piece of prose; I'm fumbling to find the right words to describe how addicted I am to reading her writing. It's as though she infuses language with magic. Shiver was heartbreakingly beautiful—emphasis on the heartbreak. 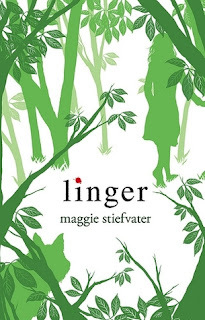 But, the ending did kindle a spark of hope, which then gets doused fairly quickly in Linger. Sam appears to have been cured and no longer shifts into a wolf, but he struggles to believe that his humanity is permanent. Unease hangs over the story from the beginning, and it only snowballs from there. Grace and Sam's swoon-tacular romance forms the centerpiece of this series, and anything that interferes with it shreds my heart. In Shiver, the pair's main obstacle was Sam's shifting; Linger doubles their adversity, which centers around Grace this time. There's something . . . amiss with her (vagueness necessary here to avoid revealing too much), plus her parents snap out of their self-involved bubble and actually try to parent. I'm still wrapping my head around that because their world consisted almost exclusively of themselves in Shiver. Now that Grace has a boyfriend, they're suddenly concerned and feel the need to establish rules because surely this is mere teenage infatuation on their daughter's part. I find it kind of funny, and maybe even a little ironic, that I've read plenty of YA in which the supposed romance lacked the emotional depth to make it come across as more than attraction or infatuation. But what Grace and Sam have—it’s the real deal. They picture themselves married one day and talk about growing old together. I can't think of many other YA couples who see beyond the here and now, and to me, that's what really sets Sam and Grace apart. Linger adds two POVs to those of original narrators Sam and Grace. I loved Isabel's character in Shiver and was thrilled to discover that she had a POV in Linger. I know that she's not an easy character to warm up to, but I totally relate to and love how she has a very low tolerance for BS. Don't even consider spinning her a yarn because she doesn't have time for that crap. Linger also introduces us to Cole St. Clair, former rock star and newly created wolf. His character is such an interesting study, especially when you compare it side-by-side with Sam's. Music has played a prominent role in both of their lives, but where it's still going strong in Sam's, Cole has walked away from it. He's walked away from the entire rock and roll lifestyle and now wants to lose himself in the oblivion of being a wolf. That's another key point on which Cole and Sam differ significantly—Sam wants to hold on to his human form and his human memories. Not only does Cole cause some ripples for Sam, but he also creates quite a stir in Isabel's world. These two—it’s all sharp edges and cutting words with them, but there's also an undeniable magnetism there. I loved every Cole/Isabel scene, and I'm as wholly invested in what happens next with them as I am in Grace and Sam's future. Linger is an entirely apt title for this novel; I kept thinking about it when I wasn't reading it. I'm still thinking about this book, and this series, and the characters, and how I excited I am to read Forever, even if it destroys me emotionally, which is highly probable. All in All: Another brilliant and very, very sad installment in the series. I'm even more in love with Grace and Sam's epic romance, and the addition of Isabel and Cole's POVs were most welcome. As much as I liked having parental units around in this series, I too felt that Grace's parents were hypocritical here. I just want them to see Sam for the awesome (albeit damaged) guy that he is! <3 And YES to all the Isabel, Cole and Isabel+Cole comments. At least we'll get more of them in Sinner haha! Aww, thank you for your lovely words! ♥ My heart is never going to be the same again, either, and we haven't even finished the series! XD This was totally THE series we needed to read after Twilight! And I am so, so, so looking forward to more Isabel and Cole in Sinner; I'm thrilled that we both already have a copy, lol! Finish this then read Sinner right away. I love Cole, you'll love him even more on Sinner. He needs his own series! OMG, I'm ecstatic to read Sinner! I can't imagine loving Cole any more than I already do, but I'll take your word for it, lol.